So who’s up for the vow boot camp challenge? I sure hope you are! This week I am dedicating, not one but three posts to helping you get your vows ship shape. Maybe the weight of writing your own vows is too much? Maybe you’re already warmed up and already for some vow action, but you can’t seem to get past the starting line. Perhaps you already know that you want to write or choose personalised vows but you don’t know what to write or what to choose? Maybe you’ve made some notes and started penning some vows already but you don’t like what you’ve written or your not sure what direction to go in. Well, if any of these apply to you, it sounds like you need to join my three day challenge vow boot camp. And the good news is, you don’t need to go anywhere, because all the info will be coming straight to your inbox today, Wednesday and Friday. Or if you’re reading this online, right here on these very pages! 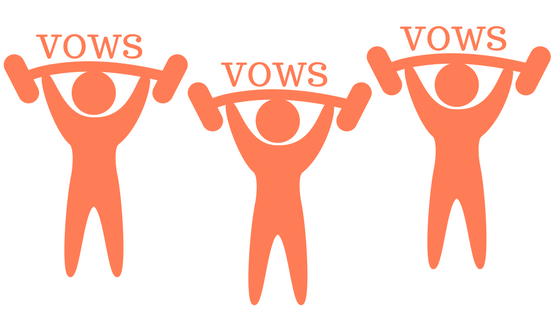 These three days of intensive vow workouts will leave you inspired, motivated and ready to get your vows in good shape and ready for the big day. So today we’re going to look at eight key things that you need to think about before you even write or even decide to write your own vows. Because believe it or not, before you get writing or vow selecting, there does need to be a bit of planning and positive mindset in place first! So check out this list of preliminaries. Two thumbs up. Make sure that writing your vows or reading your own personalized vows is something that you both want to do. One-sided vows don’t work, neither do half-hearted ones. Check you are allowed personal vows in your ceremony. You never know but your ceremony may be the type where you can’t have personal vows, especially if it’s a church ceremony or other religious ceremony, so do make sure to check, before getting too excited about the prospect of personal vows. Figure out what personal vows are. A lot of people love the idea of saying personal vows but so many people don’t actually know what vows are. Yes, they know what they are but they don’t know what they really are! How they should sound, what format they should be in and how long they should be. And it’s really very important and totally makes sense to have this clear in your mind, before you set out to write your vows. You can read this post for more info about what wedding vows actually are and the different formats. Write/choose your personal vows. There is a lot of pressure nowadays to write your own vows, because let’s face it, writing personal vows is always going to be way better than any other vows that are given to you, which don’t have any personal meaning to you. But there are also a lot of pre-written ready-made vows floating around, which with a little nip and tuck here and there, can be the next best thing to sitting down and penning your own vows from scratch. So if you’re undecided and writing from scratch feels too daunting, then maybe you should think about choosing pre-written vows that you can personalise yourself with minimum effort. Work out how to deliver your vows – This too is another important thing to think about. 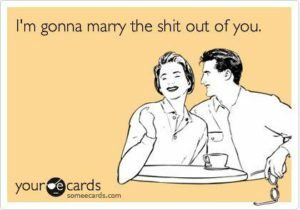 One thing people often don’t spend much time thinking about is how they will be saying their vows. Will your vows be the type that you can repeat after your celebrant, will they be recited (I don’t recommend this) or will you read them from a card (I do recommend this)! Also, if you and love bunny are saying the same vows then you could also read them line by line, so that you are actually doing your vows together. Here’s a great post on how to deliver your vows, for more info on this. Think about the impact your vows will have on you. Sometimes people choose not to say personal vows because they are so worried about being too emotional that they become scared that they will be unable to say them. Of course, this is a natural feeling to have, however, it is shame to decide not to say personal vows for this reason alone. It is wise to remember that vows make you emotional. It is wise to remember that personal vows will have a very powerful and profound effect on you on your wedding day. But it’s also really wise to remember that this is a once in a lifetime opportunity and actually even if there are tears, most people steel themselves enough to get on with the job and say all that they want to say. And in return, are so grateful that they did! Use your time wisely. So without getting all parental on you, all I’m going to say is, vows are not school exams. They are not meant to be left until the last minute to be crammed in the night before and stressed out over. Good vows are researched, thought about, planned and written calmly and thoughtfully. That’s all. Your vow presentation – whatever you choose, writing vows from scratch, or finding pre-written ones which resonate with you, think about how you will present them during your ceremony. Your vows are going to beautiful, so do them justice and put them on a nice piece of card or in a vow booklet. Not on a scrap of paper, back of an envelope or dare I even say it (and yes I’ve seen it), on a phone. Nope. Okay, so how is your day one, vow boot camp challenge going? Are you feeling motivated? Is your mind flowing and pumping and thinking of the direction that you want to go in? Good! On day two, this Wednesday, we’ll be looking at some common vow myths, busting those myths and making it really clear what you should and shouldn’t be doing when it comes to your vows. Am I the only one who doesn’t want to write my own wedding vows? Who wants to see a vow that mentions penguins, dinosaurs and ninjas? Of course you do!